Introducing something somewhat resembling a spiritual successor to WBE’s Google Surveys the Recruits. Just like the good old days, we’ll scour the Internet for any kind of links or notes regarding a featured 2012 signee, and mix it together along with a fair share of opinion in order to give some insight on what to expect from these incoming freshmen in the fall — and hopefully provide you with some easy summer reading. J-Wall wrecking fools in Class 6A-Region 3. When a local three-star quarterback made the surprise switch from UCF to Auburn on National Signing Day, a lot of people had never heard of the Central-Phenix City prospect. I actually had. I was fortunate enough to have been able to cover Jonathan Wallace and the Central Red Devils two times last fall. So after seeing Wallace in person, was the Auburn coaching staff’s eleventh-hour offer to pick up the dual-threat prospect worth it? The short answer is yes. The long answer is below. HIGH SCHOOL: No. 20 on the Birmingham News 2012 Super Seniors Best of the Rest. Passed for 1,761 yards and 12 TDs and ran for 891 yards and 28 TDs as a senior leading Central to a 12-2 season, making it to the semifinals of the 6A AHSAA playoffs. Selected as the Ledger-Enquirer All-Bi-City Co-Offensive Player of the Year as a senior. 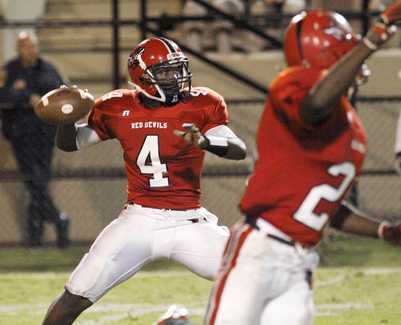 Played in the 2011 Alabama-Mississippi All-Star Football Game following his senior season. Wallace doesn’t have the size to turn heads like fellow signee Zeke Pike, as he’ll be more comparable to Kiehl Frazier’s 6-2, 220 frame after a few weeks in the weight room. But, as you can see, Wallace had plenty of success on the field in high school, accounting for 40 total TDs during his senior season in Alabama’s largest public school classification. Central fell in the 6A Final Four to eventual state-champion Prattville. ANALYST’S ANALYSIS: Wallace’s evaluation by the recruiting experts was about as consensus as it can get, as all four major services listed him as a three-star prospect. Rivals named Wallace the 25th-best dual-threat nationally and had him rated as the 28th-best recruit in the state of Alabama. 247’s analysis was even more favorable, as they have him as 16th-overall dual-threat and as the 24th-best prospect in the state. Meanwhile, Scout and ESPN, who didn’t separate quarterbacks into pocket passers or dual-threats in their rankings, naturally had Wallace a little lower on their lists. Scout named him the 69th-best quarterback nationally, while ESPN had him as the 63rd-best quarterback overall and as the 35th best player in the state. The Central coaching staff called a passing play and a running play before each snap. It was Wallace’s call to pick which one would be more successful after studying the defense. Although Wallace admitted that was key to making the Red Devils’ offense as prolific as it was, he didn’t view his pre-snap decision making as uniquely as Lowe did. The type of players Central had offensively this season were the best the school has seen in a long time. Wallace is an athletic dual-threat quarterback. As a runner, he has plenty of speed and vision, and he likes to finish off runs by diving for the marker. Wallace also has a big, strong arm, but he didn’t have to throw the ball much in a lot of games because Central-Phenix City was up by so much. A smart, well-spoken kid, Wallace also has plenty of toughness. If his accuracy improves, Wallace could be a steal. The papers were also all over Wallace’s signing, with features from National Signing Day with notes and quotes that are well worth your time. Here’s OA-News’s and here’s the CLE’s. 247 has a free video with perhaps some of those plays in higher quality right here. You can find yet another video here, and, as always, there’s the AUfficial signing day video uploaded to YouTube right here. WHAT’S NEXT? : After taking a closer look, it’s safe to say that Wallace was indeed a solid pick-up. Many were scratching their heads when Chizik and company sent a last-minute offer to a three-star quarterback after having already brought in Zeke Pike with this class, but Wallace is the classic “high-upside” prospect with lot of potential ahead of him and plenty of room to grow. In the immediate future, if Scot Loeffler decides to keep around the Wildcat/running-quarterback spot that Kiehl Frazier held last season, Wallace could be a perfect candidate to bring a different dimension to the offense and bring about a change of pace. Wallace is a downhill runner, who runs with strong legs and the mind of a runningback. He’s always falling forward and could pick up those tough first downs if Loeffler calls on him. But Wallace is coming to Auburn as a quarterback, not an “athlete,” and he has full intentions of taking snaps as the starter in Jordan-Hare Stadium someday. And while he might seem set as a disadvantage against Frazier, Pike, and Clint Moseley, the truth is that with Loeffler there are no preconceived ntions, making the race to become Auburn’s quarterback of the future is wide open. For Wallace, it was a no-brainer to make the last minute switch from UCF, to stay at home at his dream school, earn a fine degree from a big-time school, and compete in the Southeastern Conference. For Gene Chizik’s staff, picking up Wallace was well worth the couple of minutes spent recruiting him. Related: Krootin’: Irvin-Sills and Jackson commit. Nice to see these features return in some capacity! Also, happy to say I’ll be able to see most all home games in person this year, as I’ve moved back to the Loveliest Village for a job at the ROTC department! I’ll probably just buy tickets on the street to each game rather than attempting to get faculty tickets, but we’ll see. I’m definitely looking forward to the football season! War Eagle to that, Walt.